When you work in an industry that is quite niche, it can sometimes be hard to recruit people with the exact skill-set you require. It is for this reason that RS French see the importance of investing in the future with Apprenticeships and having a good relationship with a local educational establishment such as Canterbury College and their Engineering department is essential. By taking on an Apprentice and helping someone in the very early stages of their working life can be an invaluable experience for both the employer and the employee. With the right guidance, training and support an Apprentice can immerse themselves in every aspect of your business from the ground up and quite often with it being their first job they won’t yet have had opportunity to pick up any bad habits. Quite often businesses are concerned about taking on an Apprentice for health and safety reasons but the way we see it, if your current working practice means it is unsafe for a youngster then it is also unsafe for your current employees and things should change. One of the main areas of the RS French business is the conversion of shipping containers. We take a standard metal box and convert them into site offices, welfare facilities, toilet blocks or even bespoke one-off units. Having our own fabrication workshop where the whole transformation takes place means that our workshop operatives find themselves moving from one job to the next, quite often being a welder, carpenter, plumber and electrician all in one day! When it comes to employing staff it can be very difficult because people get set in their ways, if they are a carpenter, they want to work with wood, if they are an electrician they might not be happy plumbing in a sink unit. By taking on an apprentice we have the opportunity to mould someone into the exact skill set required for the job and with the variety of the role, it will not only be challenging but hopefully interesting and certainly never boring. A key to making the whole Apprenticeship work is a good relationship with the college. You need to be confident as an employer that the skills being learnt practically in the workplace are being backed up with the correct underpinning knowledge in the classroom. You need to have faith in the tutors that they know their trade and can prepare the Apprentice for the real world of work. 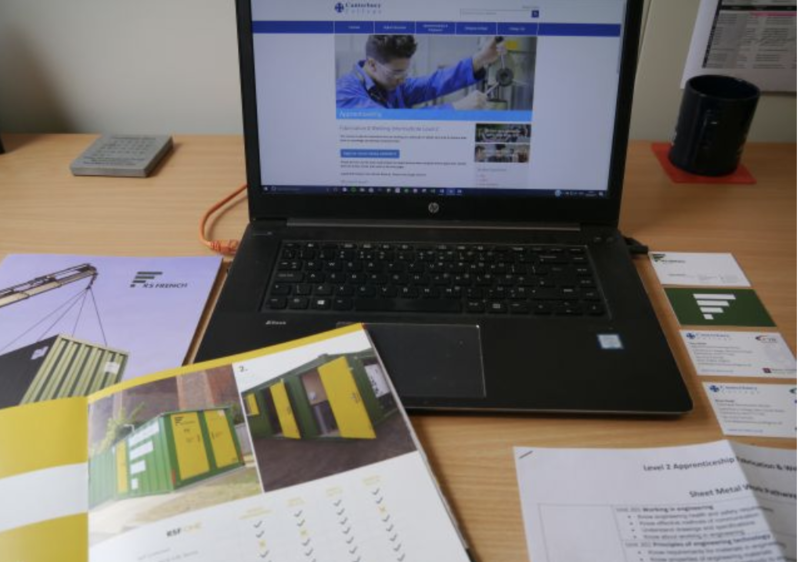 Working with Canterbury College gives RS French the confidence that as a company we are supported and can receive guidance and support at any stage throughout the Apprenticeship. From initial contact with their Training and Recruitment Advisor through to conversations and visits from the Course Tutor and Head of the Engineering Department. Having met them all it means they know what we need from an Apprentice and the opportunities that are available to potential Apprentices long-term. With the interview process looking to start imminently, RS French are once again ready to invest in the future.